The Department of History is a proud sponsor of Doors Open Thunder Bay, an event taking place on Saturday, Sept. 8 between 10 am and 4 pm. 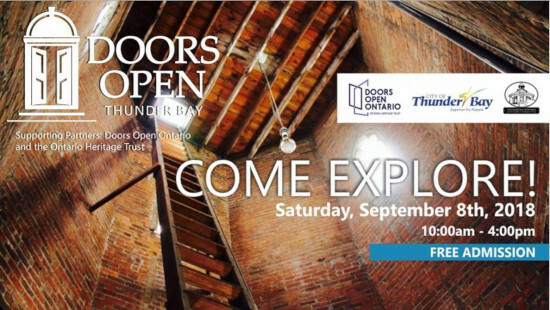 Doors Open is an opportunity for people to explore some of Thunder Bay’s most unique structures and heritage sites. This year at the Paramount Theatre (24 Court St. S., there will be a series of screenings of Long Walk Home: The Incredible Journey of Sheila Burnford, an award winning film by faculty members Dr. Ronald Harpelle and Kelly Saxberg. The film is a biographical sketch of one of Thunder Bay’s most famous and remarkable authors. Along with the film will be a display of items from The Burnford Project, which is an initiative to index Sheila Burnford’s personal papers. Dr. Harpelle and his team of students have been working with the papers for four years and the papers will soon be available for public access through the Thunder Bay Public Library. Screenings of the film will take place at 11 am, 1 pm and 3 pm and this is a free event. Sheila Burnford will also be inducted into the Walk of Fame in the Village Green at Victoriaville Mall on Saturday, Sept. 8 at 11:30 am. These events are opportunities for students, faculty and the public to find out more about Sheila Burnford and The Burnford Project. Visit Doors Open Ontario for more information.